The whole painting and the decorated roof timbers. Once the interior scaffolding was in place we were able to get up close to the 'Doom' painting above the chancel arch. 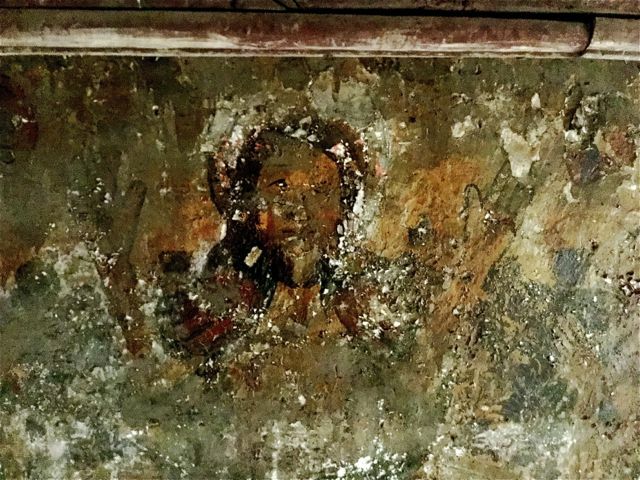 Such paintings were common features in churches but are only rarely preserved. Climbing the scaffolding, under supervision of course, proved quite popular and a number of local residents came up to take a look. Visitors galore: the architect ponders and Mark gets excited. The Cropredy 'Doom' painting was known to be in pretty poor condition but we could see it was important so after consulting with various interested parties we called in the experts, Stephen Rickerby and Lisa Shekede. Here is the summary of their exceptionally detailed technical report. Stephen and Lisa begin their analysis. Painting history and significance: the imposing parish Church of St Mary the Virgin, Cropredy, preserves significant medieval painting. The largest and most notable is a 15th-century Doom, which occupies its customary position above the chancel arch on the nave east wall. Despite its very poor condition, this is exceptionally important. Although its iconography includes expected late- medieval motifs, a highly unusual if not unique feature is the reversal of the normal positioning of the Virgin and St John the Baptist on either side of Christ. Stylistically and technically the painting is of high quality, and can be closely compared with the celebrated late-medieval Doom at Coventry. Decorative painting on the adjacent roof timbers, which includes the rare depiction of two dragons, is also highly important, since so little such painting now survives in English medieval churches. Fragments of painting in the north aisle and the chancel attest to the presence of high quality schemes in other parts of the church in the late-medieval period. A previously unrecorded area of painting was found adjacent to the Doom on the nave north wall. Conservation context: discovered in the 19th century, the Doom’s condition is now extremely grave, due mainly to the failure of past preservation attempts. Obscured by a discoloured non-original coating and accumulated dirt, the severity of its condition – and its significance and quality – have been overlooked. A programme of roofing repairs begun in the second half of 2016 allowed access to the painting for the first time in its recent history, permitting its re-evaluation. Rickerby and Shekede made a site visit on 25 October, 2016 to provide initial advice. A fuller condition assessment and technical examination were recommended, which were carried out from 5–6 January, 2017, with subsequent analysis and research carried out thereafter. 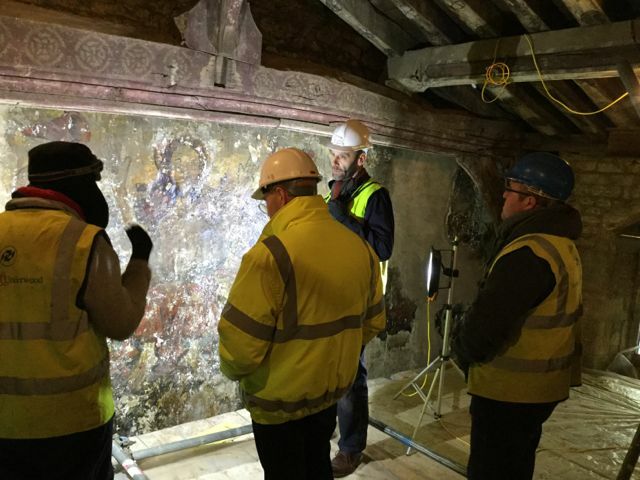 The opportunity was also taken to assess the other surviving medieval paintings in the church. Examination and investigation components: the condition assessment and technical examination establishes potential risks to the paintings based on evaluation of: current condition; original technology, the nature and impact of added materials; damage and deterioration phenomena; and the role of environmental factors. The painting assessment was mainly achieved by visual examination and other non-invasive measures; in addition, 5 paint samples were taken for microscopic analysis and micro-chemical testing. Original technology: Cropredy’s Doom is distinguished by a lavish palette and sophisticated application techniques. Applied in oil, pigments are richly blended and layered, to achieve effects of luminosity and transparency. This typifies painting practice of the period, as influenced by techniques originating from the Continent. The selective use of gold marks out the painting as exceptionally rich. The present Doom is the third medieval painting in this location. The concealed schemes also have rich palettes. There are significant technical differences between the three schemes: paintings 1 and 2 are executed on lime-based grounds using a glue medium, producing matte painting effects; painting 3 conveys more saturated and brilliant colour effects in an oil medium. Painting on the nave roof, although simpler in execution and now much altered, incorporated bright white and red lead pigments, and lead tin yellow, making for a bold scheme. Painting in the north aisle and chancel, although not examined in detail in this study, were clearly also originally executed to a very high standard. Physical history: the Doom has been badly affected by chronic structural loading issues. It’s physical history is defined by renewal in the late-medieval period, of concealment at the Reformation, of rediscovery in the 19th century, and by subsequent efforts at preservation, which led to its severe and comprehensive deterioration. • • plaster damage: stress loading on either side of the chancel arch, cracking and failure of poor quality repair materials, poor bonding between superimposed plasters, and the reassertion of old substrate cracks are associated with large areas of unstable plaster delamination and displacement. Some areas are of delaminated plaster are at risk of loss. Like the Doom, the painting in the north aisle is flaking badly, because it too was coated. The (uncoated) painting in the chancel survives in good condition. The painted nave roof and associated sculptures survive in stable condition, but their painting techniques makes them easily susceptible to damage. Risk assessment: the coincidence of past flaking with the presence and degradation of the non-original coating on both the Doom and the north aisle painting is clear. Deterioration processes have probably involved damaging dimensional changes in the coating, provoking paint flaking. Environmental factors (eg, fluctuations of temperature and humidity) are likely to have been influential in this. 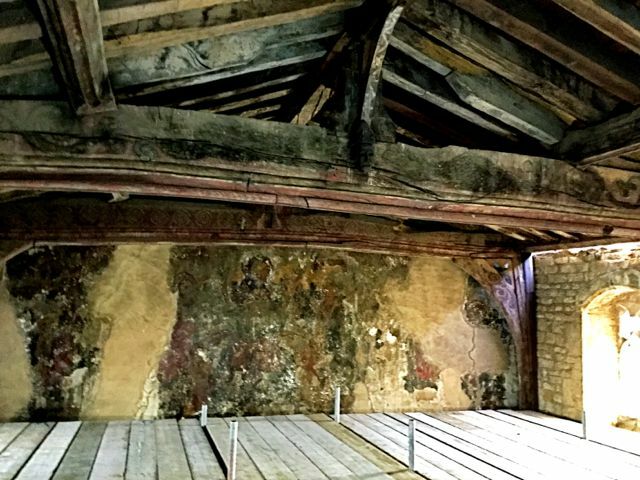 Even so, the physical history of the paintings since 2004 indicates that the prevailing microclimate in the church is not a critical factor in current deterioration, with minor paint losses now occurring at a very slow rate. At present, principal deterioration risks can be instead mainly attributed to continuing intrinsic degradation of the aging coating. • • chemical reactions associated with aging of the coating are likely to include its increasing polarity and acidity. These changes can in turn: enhance future swelling and shrinkage reactions, causing new flaking; contribute to progressive and potentially irreversible darkening; and promote increasing insolubility of the coating, reducing the possibility of its safe removal from the paintings. 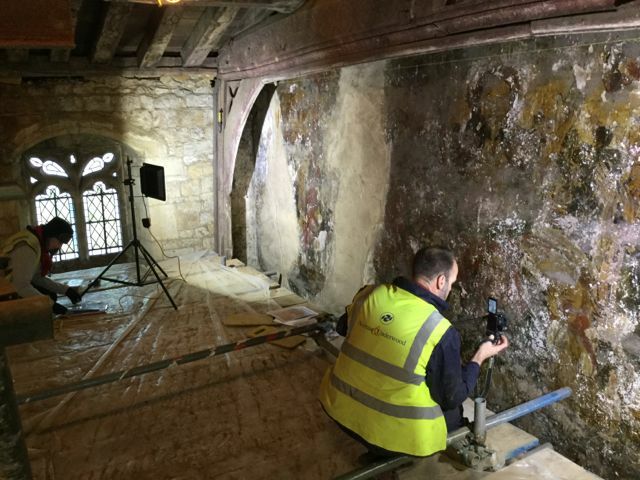 The presence of the coating on these important medieval wall paintings therefore presents a number of long-term issues that should not be ignored. • plaster stabilization: by means of grouting and repair, to secure delaminated and cracked areas of original plaster on the Doom painting. 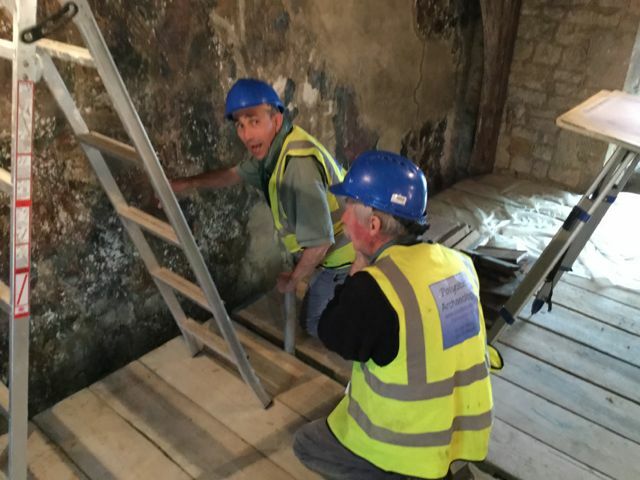 No treatment is required for the painting in the chancel, which survives in stable condition. Removal of superficial dust and dirt is also recommended for the roof painting and polychromed carved heads, but given the vulnerable nature of the original paintwork, no other treatments are advised. Uncovering and stabilization are also recommended for the fragment of painting adjacent to the Doom on the nave north arcade. Cleaning and stabilizing the Doom and north aisle painting will be challenging treatment procedures, requiring a carefully informed approach and integrated methodology. Chemical similarities between the original painting and the added coating complicate cleaning issues, and materials and procedures will need to be developed that offer control over their impact. Surveillance of results should be incorporated into the cleaning strategy, which must be guided by a thorough knowledge of the nature and interaction of the original and added materials. Cleaning these two wall paintings at Cropredy may be seen as an aesthetic intervention, which would do much to re-establish their visual integrity and quality, thereby contributing to their future appreciation and preservation. But in addition, removal of the degraded coating would also address long-term issues relating to problematic chemical changes of its component materials. Lastly, although current environmental factors do not seem to be a major activation mechanism of painting deterioration, it would be advisable to establish a better understanding of these parameters in the interests of the long-term conservation of the paintings. A remedial treatment programme should therefore be complemented by an environmental monitoring and assessment component.